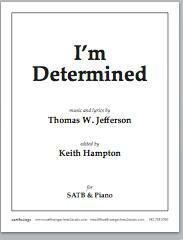 I’m Determined is a song of persistence and perseverance—as depicted in the powerful lyrics—which carries the message to walk with Jesus each and everyday, to keep holding on, and let nothing get in the way! The driving piano accompaniment features broken octaves in the left hand underneath subtle jazz harmonies, which help propel the piece along and echo the song’s message. The syncopations should be stressed and the articulations observed, as indicated. The text should always be sung with energy and expression. In the vamp section (starting in m. 76), the keyboard player should improvise a short solo to the chord changes before the voices enter. After the solo, voices entering in the following order as indicated in the score: sopranos, basses, tenors, and then altos. As before, the syncopations should be lightly stressed—or “leaned into”—in a swell-like fashion. Each section of the choir can be highlighted and repeated, at the conductors discretion.